The Nationals are teaming up with the Official Cherry Blossom Festival crew to celebrate the beginning of Spring this April. 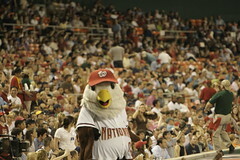 Festivities include an appearance by Screech and the GEICO Racing Presidents in the National Cherry Blossom Parade on Saturday, April 10 in addition to on-site events at Nationals Park. Cherry Blossom Festival representatives will be present at the April 3 exhibition game vs. the Boston Red Sox and two games vs. the Phillies on April 7 & 8. We’ll keep you posted as more details become available. Quite the pairing in the game of renewal! FYI/reminder, Nationals Park also has cherry trees. Does anyone know when they begin to peak?